Looking for hotels in Sheboygan Wisconsin? We have 11 different hotels to meet everyone's family vacation budget. Looking for a bed and breakfast? We have 2 bed and breakfasts in Sheboygan. Are you looking for a Lake Michigan campground? Sheboygan has Kohler Andrae State Park on the Lake Michigan shore. Room rates generally fluctuate here in Sheboygan from winter to summer, and especially for PGA and Road America events. As a longtime resident fisherman of Sheboygan, I'll give you a little description of where your hotel is and what you have close-by. Be sure to tell them the "Sheboygan Fishing Guy" sent you! Just off I-43 at the Highway 28 exit East. The Holiday Inn Express is across from the Harley Davidson dealership and Cruisers Custard on Taylor Drive. There's 2 gas marts, a McDonalds, a Wendy's and a Walmart close-by. 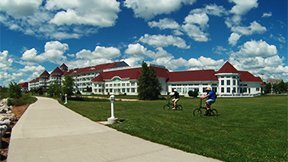 The beautiful Blue Harbor Resort located on the majestic shore of Lake Michigan, is at the center of Sheboygan's lakeshore and riverfront activities. The Blue Harbor is one of the best hotels in Sheboygan Wisconsin to take your family on a Lake Michigan vacation. Just off I-43 at the Highway 28 exit East. The AmericInn Motel & Suites is next to the Harley Davidson dealership and Cruisers Custard on Taylor Drive. There's 2 gas marts, a McDonalds, a Wendy's and a Walmart close-by. The Harbor Winds Hotel is located right on Sheboygan's beautiful river boardwalk. Step out the back door for a refreshing walk on the boardwalk where there's shopping, restaurants, charter boats and river fishing. Schwarz Fish across the street, has one of Sheboygan's best fish fry's. Take out only. Just off I-43 at the Highway 23 exit East. Drive just a minute and you will see it on your left. There's a gas mart, movie theater, McDonalds, restaurants and the Sheboygan Mall close-by. The GRANDSTAY Hotel is a half a block off 8th Street from the Stefanie H. Weill Center. Walk 8th Street to see the old world charm of Sheboygan's original downtown. There's lots of shopping, restaurants and Pubs. Just off I-43 and County Highway V exit East. There's a gas mart next door. It's about a 5 minute drive North to the City of Sheboygan. Just off I-43 and Highway 23 exit East. You will take the first exit on the right to Taylor Drive, then turn left under Highway 23. The Super 8 is right behind McDonalds and the Marcus movie theater. This is one of the fishermen friendly hotels in Sheboygan Wisconsin. They have boat and trailer parking, and will keep your fish in their freezer until you checkout. Just off I-43 and Highway 42 exit East. You will see the Quality Inn behind the Hardees restaurant. There's a Gander Mountain, Kwik Trip and several restaurants close-by. The Quality Inn is one of the hotels in Sheboygan Wisconsin that's close to a great Sheboygan fish fry at Shuffs Last Resort. The Econo Lodge is on the corner of 8th Street and Center Avenue, right across from Sheboygan's tallest downtown digital clock and temperature gauge. Enjoy the old world charm of Sheboygan's 8th Street where there's shopping, restaurants and bars. The Econo Lodge is one of the hotels in Sheboygan Wisconsin that's just blocks away from Lake Michigan and the river boardwalk. The Fountain Park Motel is located downtown on 8th Street, right across from Sheboygan's beautiful Fountain Park. They have 2 excellent restaurants, Fountain Park Family Restaurant and Caffe' Tuscany. Enjoy the old world charm of Sheboygan's 8th Street where there's shopping, restaurants and bars. About 10 minutes north of Sheboygan on our Lake Shore Drive. Lake Orchard Farm Bed and Breakfast is located on the shore of Lake Michigan and minutes away from Whistling Straits golf course. Father Wind Bed and Breakfast is close to the Pigeon River and minutes away from Sheboygan's Lake Michigan shore activities. There's a pub & grill about a block away that has a great Sheboygan fish fry. Manning's Irish Pub on North 15th Street. Just south of Sheboygan, Kohler Andrae State Park has camping, swimming, hiking and natural Lake Michigan shore sand dunes.